While many celebrate today as the official start of Summer, Memorial Day really is a day to remember those who have died while in service to our country. It is a day of honor so today we thank those men and women who have given the ultimate sacrifice while defending out freedom. 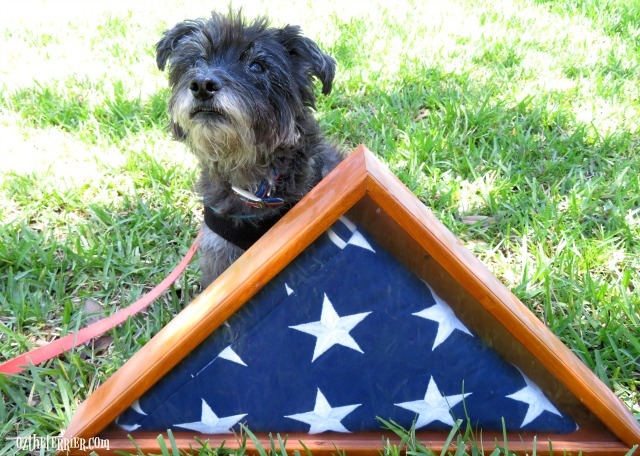 Oz is posing with a memorial flag - a flag that is folded upon the death of an active duty soldier as well as an honorably discharged veteran. The U.S. memorial flag is folded 13 times in honor of the first 13 colonies and when finished, only the field of blue stars is visible. The field of blue stars is to signify our country's motto "In God We Trust". We like to think that the field of blue stars is a reminder that the soldier has gone to heaven. As you finish your Memorial Day weekend celebrations today, please take a moment to thank all those who have gone before us and who made the ultimate sacrifice for our freedom. Freedom is never free! Beautiful tribute. Thank you Oz. Awesome post, Oz! Enjoy your Memorial Day! No, not free at all. Beautiful, touching post. You said it all perfectly! Well done, Oz! God bless those who fell while fighting in our nation's military!! We are so grateful for those that have made the ultimate sacrifice for our freedom. Thank you for sharing that bit about the folding of the flag - I didn't know that! I've always been fascinated watching them do that with such precision. Thank you for sharing this! Happy Memorial day. Do you run the welcome wagon, or do you know who does?